CURRENT TRENDS THAT WILL DEFINE THE FUTURE OF APP DEVELOPMENT The world is digitally disrupted to a great extent today. Apps have become a major part of that digital transformation. And, mobile app development has observed phenomenal change throughout the transformation. As mobiles have become the colossal point of attention for both businesses and individuals, multiple mobile apps are built to meet their specific needs. Gartner estimated that about 70 percent of customer software engagement will be through mobile applications by 2020. They will turn out to be an important dimension for every business. Together with Industry 4.0 technologies, mobile app development has evolved adopting several trends. Some of the major trends that will push the future to another level in mobile app development include the below ones. 1. 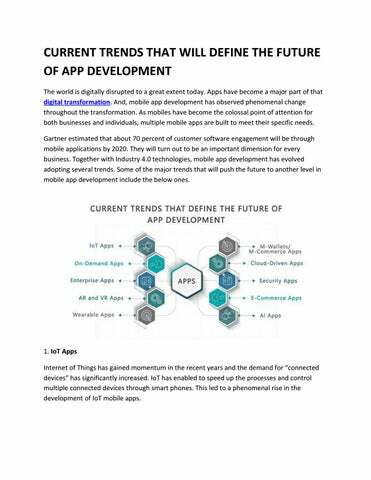 IoT Apps Internet of Things has gained momentum in the recent years and the demand for â&#x20AC;&#x153;connected devicesâ&#x20AC;? has significantly increased. IoT has enabled to speed up the processes and control multiple connected devices through smart phones. This led to a phenomenal rise in the development of IoT mobile apps. â&#x20AC;&#x153;The global IoT market will grow from $157 billion in 2016 to $457 billion by 2020, attaining a Compound Annual Growth Rate (CAGR) of 28.5.â&#x20AC;? (Forbes) Employing sensor technology, mobile apps leverage IoT for remote monitoring, automation and controlling physical activities of gadgets. Several industries: manufacturing, retail, health, transportation, agriculture, infrastructure and automotive are adopting IoT to save both time and money. The scope for IoT mobile apps has grown to access IoT enabled devices. From large-scale companies to small-scale ones, businesses are employing IoT strategies to render customer-centric services with real-time forecasts making IoT mobile apps as mainstream. 2. AI Apps Artificial Intelligence is advancing at the speed of light and became the hottest trend in app development. It has the ability to impersonate cognitive functions like humans and can complete tasks which require high-end skills such as problem-solving and decision making. Mobile apps are built using this artificial intelligence to manage a handful of tasks. One of the popular apps of this kind is Appleâ&#x20AC;&#x2122;s SIRI. Whether it is finding a route to your destination or recipe of your favorite dish, SIRI helps you find the best answer. It grabbed the attention billions of people across the world. A number of companies are investing exorbitant amount to get the best AI aided applications to boost their capabilities. With advanced machine learning and other cognitive interfaces, AI mobile apps are making their way into every sphere. The substantial insights of these applications are used to create intelligent marketing strategies and customer-centric communication for businesses. And, AI mobile apps are fulfilling the desire to have a personal assistant to manage everyday tasks. 3. AR and VR Apps Augmented Reality and Virtual Reality lets you escape into another world. It is expanding faster with constant call for AR & VR mobile apps from multiple enterprises- from gaming companies to furniture enterprises. The trend is never-ending as it is integrated 3D models in real time in their actual environment. With Pokemon Go and others, AR apps are emphasized a lot more than earlier. Biggest players in the market like Google and Apple are doing their part to enhance the user experience. Multiple other VR companies are building VR/AR headsets and other devices to enable vivid presentation in mobile phones. This gives a way for app developers to build mobile apps to enhance the capabilities of the smart phones. These VR/AR apps are changing the way we communicate, shop and buy on mobiles. They provided the landscape for business to actually present their products/services through virtual perceptions. 4. Enterprise Apps Technology has made its inroads every sector. Mobile apps came out as tools to ease up complex structures often involved in operating business equipment. Enterprises are looking for applications that will allow them to coordinate easily with a group and bring out favorable outcomes. Enterprise mobile apps are developed to enhance the collaboration between teams as well as to manage vital business processes by simplifying them. Big giants with a huge number of employees face issues in managing mixed criteria. Mobile apps assist in handle huge amounts of data from each individual and collectively. Different enterprise mobile apps are built to serve each purpose for smooth flow of work in an organization. For instance, it is very difficult for an employee to remember what exactly happened on December 3rd. An enterprise app is built to update everyday activities and store daily events. A study organized by Adobe identified that 77 percent of businesses found enterprises apps useful and 66 percent would increase their investment in enterprise management apps. It sure will rise as a mobile app development in the next few years. 5. Wearable Apps According to the International Data Corporation (IDC), the wearable market is estimated to increase from 113.2 million shipments in 2017 to 222.3 million by 2021 with 18.4 percent as Compound Annual Growth Rate (CAGR). Apple Watches, Google Daydream, Pebble, Fitbit Flex and others prompted the change from ordinary to smart wearable. Most of these applications are built with standalone functionality. But it also may rely on smartphones to show a clear picture of the activities. This opens up new opportunities for app developers to experiment. The smartphone will become the dashboard to interpret gadgets like on-body health sensors, smart watches, smart accessories and a wide range of sensors embedded in clothes, jewelry and shoes. These smart wearable communicate directly with smart phones to display real-time information. Various areas like healthcare, fitness, fashion, sports, and security widened the scope of wearable mobile app development. 6. Cloud-Driven Apps Cloud computing is continuously evolving and businesses of all sizes are harnessing the power of the cloud to streamline operations and enhance overall productivity. It extended as a platform for app developers to incorporate multiple dimensions saving huge costs involved in storage. Cloud enabled to store information without interfering with internal phone memory. This enlarged the audience moving to cloud. It is predicted that cloud apps â&#x20AC;&#x153;will drive 90 percent of total mobile data traffic by 2019 globallyâ&#x20AC;? (Cisco VNI Global Forecast 2015-2020). Industry experts believe that with the rate apps are being modernized, it could be more than the estimated percentage. With its affordability, availability and scalability, more and more businesses are choosing cloud mobile apps for their services. Building apps on cloud platform allowed apps to be dynamic and provided feasibility for change. Inclusive of all this, cloud mobile apps grew as a trend to permit apps to seamlessly function on multiple platforms. 7. E-Commerce Apps Millennials are likely to shop almost everything online- from a toothbrush to a home altogether. Not just them, almost everyone today prefer to check the products online before they buy them in a local store. Mobile apps have become a great alternative to websites for every industry. E-commerce industry has experienced a dramatic transformation with mobile apps. CBS News has reported that a major number of retail businesses saw an exceptional increase through mobile apps as much as 200 percent when compared to last year. Innovations in mobile app technology enabled customers to choose from multiple options faster with effective comparison of the products and detailed information. As mobile apps let customization for every customer, businesses are looking forward to moving to mobile apps. With or without an official website, from small-scale businesses to large ones are picking up mobile apps to sell their offerings. Along with other technologies, such as big data, AI, and AR, mobile apps have enhanced the shopping experience further. 8. M-Wallets/ M-Commerce Apps Digital Wallets have already been adopted in a large manner and they are expected to grow more in the future. With the rise in e-commerce sales and digitalization, customers are likely to adopt e-wallets which make it easier for them to pay everywhere. They are changing the way customers buy. These wallets are affecting customerâ&#x20AC;&#x2122;s attitude as well as their behavior by involving more convenience. 2017 UPS Pulse of the Online Shopper revealed that m-commerce industry to hit $250 billion by 2020. E-commerce mobile apps brought a lot more flexibility than the websites. And, m-wallets are taking this flexibility to next level. These e-commerce mobile apps are linked with m-wallets so that the customers can pay through them avoiding the hassle of debit or credit cards. By ensuring robust security to money, these m-commerce apps have become a prominent trend in the app development. Some of the m-wallets which already boomed in the market today include Paytm, Mobikwik, etc. 9. Security Apps Mobile phones are allowing us to do almost everything online at any point of time from any location. One may have banking details or track fitness and thanks to the Internet of Things, one can control activities remotely, and even work. In this process, a lot of personal and confidential data is stored in mobiles. Mobiles become an access point for all crucial information. In this context, security of the mobiles is more important than ever. Security apps are no longer a choice, but an absolute necessity now. Many a time, some of the apps like financial apps come with security standards of their own. However, they do not guard all the information stored on the phone. A number of individuals/ companies have become a victim of security breaches. Mobile apps are developed specifically to ensure security of the mobile with a couple of strategies. They have emerged as a serious trend in mobile app development. 10. On-demand apps When you are busy with your work, and you canâ&#x20AC;&#x2122;t manage simple chores that involve your time, on-demand apps become the key to complete those tasks. On-demand apps make everyday needs reachable just by a single tap on the phone screen. There is an app for everything. Some of the on-demand apps focus on table-booking, laundry service, booking tickets, sending gifts, booking a cab, groceries, medicines, fitness & beauty and others. These apps are right with you and cater to every need just in minutes. They enable users to receive services and goods immediately. These are still striving to make everything available at the fingertips of users. So, now that we saw the trends in mobile app developments. Furthermore, there are always different trends which rise with the need. Different industries are exploring mobile apps to manage their operations in an effective and efficient way. If you want to build an app for your business or you want to transform your idea into an app, you are at the right place. 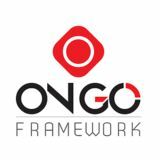 At Ongo Frameworks apps are built faster than ever. Our professionals are skilled in developing a diverse application and delivered projects across the globe.